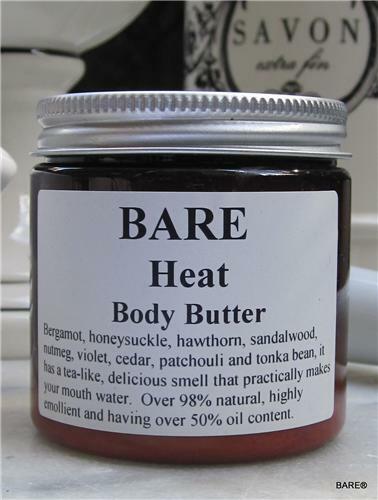 BARE "HEAT" (unisex) Resplendent with tuberose, sweet honey and ylang. The other cooler, less "loud" flowers round the bouquet so you can smell more than the honeyed sweetness and "rubber" note in the tuberose. The final drydown is heavy with woods, musks and dry earthy patchouli, oakmoss and vetiver. This scent, even though it is a modern reformulation, is divine. Helliantus Annuus (Sunflower) Seed Oil, Soja Hispida (Soya Bean) Oil, Simmondsia Chinesis (Jojoba) Seed Oil, De-Ionized Water, Natural Beeswax, Emulsifying Wax NF, Sodium Borate, Aloe Barbadensis (Aloe Vera) Leaf Juice, Fragrance, Chamomilla Recutita (Matricaria) Flower Extract (Chamomile), Disodium EDTA. Phenoxyethanol and Caprylyl Glycol.